I hate multi-post articles but this one covered so much ground that I had to split it up into 3 pieces. 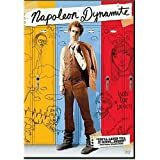 A few years ago every girl I knew was ecstatic about the movie Napoleon Dynamite. I ended up watching it and I found it rather dry and boring. I did appreciate how stylized it was though. I often asked them why they thought it was so funny and they usually had a hard time pinpointing it to me. This made me realize that female and male humor was vastly different. I started searching for answers on the differences.